Spaceone.io is a fast paced, online, multiplayer, battle game. It is set in space. 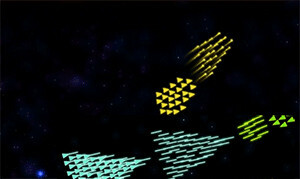 Players have to engage each other in space battles. You have to move through the empty expanse of space with a fleet of triangle-shaped space crafts and decimate all other fleets you see. Victory is won only after the fleet of your opponent is completely wiped out. The game is very simple. All you have to do is destroy the enemy and increase your fleet size until you are the top player on the Leaderboard. Like most shooting games, you rack up points by firing and destroying your enemies’ fleet. You shoot laser pellets at your opponents to destroy them. Just fly through endless space and unleash destruction upon all who dare cross your path. Besides the other space fleets, there are some random, flying pink balls, and triangles in your path. You gain an extra ship when you destroy one of the flying pink balls or triangles. The more of these things you destroy, the bigger your fleet gets, and the bigger your fleet the more destructive power you have at your disposal. Also, every time you hit an opponent’s fleet they lose one space craft from their fleet, the same thing happens when they hit you too, you have to be careful to evade their shots. The graphics of spaceone io are simple and very colorful. However, this does not in any way reduce the fun of playing it. The game is exciting to play and easy to master. You should try it. The controls for this game are quite different from most other .io games. That is because, unlike most, you don’t need the WASD keyboard buttons for navigation in this game. All you need is the mouse for navigation and shooting. The spacebar on the keyboard can be used for shooting too if you like to play with both hands.